James Mylne, who calls his art "alternative contemporary" is a well-known British contemporary artist known for his drawings in ballpoint pen. His technical abilities with the unorthodox art medium have earned Mylne recognition in both the Europe and the UK, where he is considered among the leaders of the genre and emulated by many art students. Mylne has collaborated with famous professionals including photographer Terry O’Neil and Rolling Stones guitarist Bill Wyman. He has earned global recognition, exhibiting his ballpoint drawings since 2001 alongside the likes of Banksy, Damien Hirst, Shepard Fairey, D*Face and Mr. Brainwash. He is viewed very favourably by the media and has been featured on the BBC and ITV. He work has featured heavily in newspapers and magazines including The Telegraph, Express, Evening Standard, GQ and Daily Mail, which has called Mylne's work "stunning" and likened his ballpoint pen photo-realism to "beautifully painted canvases". Online trade journal The Ballpointer, observed, "Many other so-called hyper-realist ballpointers' artwork rely on distance or reduction to tighten loosely hatched linework. Mylne's artwork needs no such buffer". His drawings can take between 25 – 100 hours to complete and he says; "Being ballpoint pen, you can't rub out or paint over mistakes. Basically you can't make a mistake." Mylne says that he began drawing realistic artwork from an early age. Around the age of 14 he discovered the benefits of using ballpoint pens over pencil and from the age of 19 he was selling his ballpoint drawings. He was one of the only people working in this medium worldwide at the time. The artist's photo-realist likenesses are often mistaken for photographs and he is considered to be the UK's premier ballpoint pen artist. Of his choice of ballpoints as a preferred medium, Mylne credits the pen's capabilities of precision and distinct contrast. Such "technical" aspects of the medium have interested him most, in part fueling his desire "to master ballpoint photo-realism". Mylne has said that biros appeal to him because of the concentration required, noting that, as there is little room for error, it forces a certain level of focus which has meditative qualities. Mylne has worked with Microsoft to promote the company's Surface Pro 3 tablet and digital pen. Using the new medium, the artist recreated some of the most famous portrait paintings in Britain's National Portrait Gallery in London. His digital depictions were consequently displayed at the National Portrait Gallery. James Mylne attended foundation courses at Chelsea Art College, London, in 2002. Studies there were followed by 3 years at Camberwell, where he received his BA in drawing in 2005 and his MA in 2006. 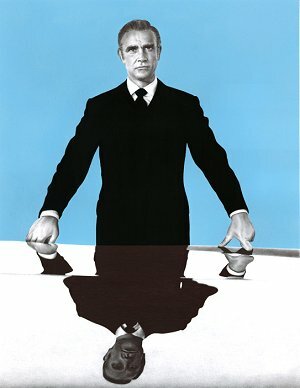 More videos and James Mylne's "Reflecting Bond" for sale. © If artwork shown on ArtFair is already sold or unavailable for immediate sale, we'll do our utmost to source a similar edition for you. ArtFair is a trading name of LeadFair Ltd. Co. Reg. Number 08565869. Reg. Address: Swift House, 18 Hoffmans Way, Chelmsford, Essex. CM1 1GU. Registered in England and Wales. VAT Reg. No. 169725662. Registered with the Information Commissioner's Office: Data Protection Reg. No. ZA025012. Artwork prices can go up or down. ArtFair offers fine art, contemporary art, urban art, pop art, and modern art through our own collection and our global network of art gallery partners, art dealers and private collections. Keywords: James Mylne Art For Sale.